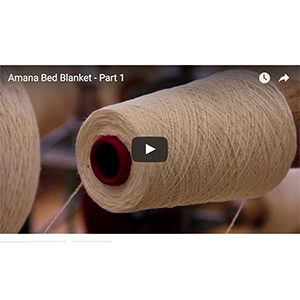 Our warping creel is the first step in the production of an Amana blanket . This video shows our historic creel in action, warping our very first queen sized blanket. Our new bed blankets are the same great quality, just with more blanket to love! The warp has made it to our loom and is now weaving our first queen sized blanket. Strand by strand it is drawn into the harness then moved to the loom where the lengthwise warp is weaved with the horizontal fill. Each string is important, if one breaks the whole machine stops until it is found and retied. The result is a high quality American Made finished product that can be enjoyed for many years. Come and visit the Little Red Wagon in Amana, Iowa. We are your "fun sized" toy store. Offering more than you can imagine! Spring has sprung at the Amana Meat Shop! Each year, after a short recovery from the busy holiday season, the Amana Meat Shop starts encouraging spring by crafting traditional Amana Colonies Easter Eggs. Vivian lets out the "secret" of how Amana Easter Eggs are created and to why they can be enjoyed for years and years. Video - What are "End of the Day" Easter eggs? Most Amana Colonies Easter eggs are one color. But some eggs are dyed with two colors at the end of the day, in order to finish the day with no extra dye. Watch our "End of Day" Easter Eggs video to find out what the story is behind why some Amana Eggs are multi-colored. Video - Christmas 365 days a year! The season of Christmas never ends at The Christmas Room in Amana at our General Store. We welcome Christmas enthusiasm everyday of the year! With a large selection of fun and festive along with traditional decor there is something for everyone. 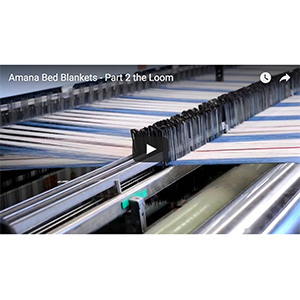 Watch and learn about the Amana Woolen Mill's blanket looms, our Furniture and Clock Shop, The Christmas Room, our Easter Eggs and the creative process behind our handmade textiles.